When Bray Wanderers return for pre-season training on January 16th, there will be changes aplenty. The first team squad has seen an almost complete overhaul, while the backroom staff has also seen significant change from the 2009 season. Dane Massey, Chris Shields, Jake Kelly, Dave Webster and Dave O’Neill are the only remaining first team players from last season’s squad, meaning that not a single Bray player will be over the age of 20 when the new season kicks off. But the changes to the squad were inevitable according to Bray boss Eddie Gormley. ‘Well obviously finances dictate the kind of squad we’re going to have’, explained Gormley. Seagulls fans would like to see some players with more experience brought in to help give some guidance to the youngsters, but once again the lack of finances look set to put paid to that. People were quick to write off UCD’s chances of promotion last season when they followed the same path and put their faith in youth only to see the Students go on to win the First Division, but does Gormley believe his side could follow in the Dublin side’s footsteps? Gormley has often praised his youngsters in the past for their devil may care attitude, so perhaps having an entire squad with that mindset could be a positive. ‘If you look at the teams we put out on the pitch for the last three years they had never really gone out with that fear factor anyway. They’re told to go out and express themselves and that’ll be no different this year, we‘ll go out, we’ll try and play positive football and try and win as many games as we possibly can. O’Neill, Massey Shields et al were lucky to have League of Ireland legends ‘Bo’ McKeever and Paul Osam coaching them during the 2008 season, but the duo, as well as Eddie Wallace, have now all left the club. And another old head whose knowledge of the game helped the youngsters out was Colm Tresson. Tresson announced his retirement in the aftermath of the play-off defeat to Sporting Fingal but Gormley is hoping to persuade the club’s record appearance to dust off the boots for a final year. A very happy new year to all of you! Back to the grindstone, I had serious difficulty sleeping last night, trying to get back into a routine after a week of going to bed and getting up at all hours! 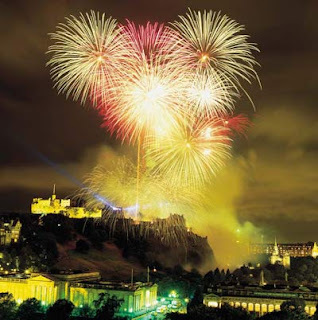 I had a fantastic new year at Hogmanay in Edinburgh. At a street party, ringing in the new year with 'Madness' and 80,000 people all up for a party. The fireworks, which only lasted for 4 mins were out of this world and a definate highlight of the couple of days. Celebrity Big Brother will ensure that January is a busy month for celebrity news and gossip. Jordan's current squeeze Alex Reid and her ex Dane Bowers have both gone into the house after having a scrap at the weekend at her New Years party which should hopefully make for interesting viewing! There are some other interesting faces like actor Stephen Baldwin, ex footballer Vinny Jones and Stephanie Beecham from Corrie and Dynasty. We have a really cool fleece lined rain set to give away on kids clues this week and a cd prize pack for Never gonna get it. Join Rob and I again tomorrow- we're live from 6. BACK ON THE AIR AFTER THE HOLIDAYS! Well there I was on Sunday evening staying up stupidly late watching rude tube on the TV showing the best web videos of 2009 when the reality hit that yes tomorrow WAS Monday and yes it's back to work time! But surprisingly when the alarm went off (or is that on??) at 5am I was straight up and into the shower grabbing a coffee and heading to work. I usually have the odd moan in work but it's amazing how much you miss being behind the mic when you have a week off, mind you I was loving the cosiness of my bed in the mornings safe in the knowledge that no alarm would be ringing in my ears :) I had a fab Christmas too, back home to the Mammy for Christmas dinner and the usual enjoyment of sitting in the living room belly almost full (needed room for the selection box) watching a few movies on the TV. I don't eat ham so there was extra turkey for Rob this year :) That meant on St Stephens Day it was turkey with chips and gravy and the next day I had a turkey curry. Oddly I only ever eat turkey at Christmas and I don't know why. Santa looked after me this year because as anyone will tell you I've been a very good boy! A new Tom Tom Sat Nav, vouchers for paint balling, a bottle of green Polo (my favourite aftershave) the "Scrubs" box set and the obligatory selection box are just a few of the gifts I received this year, lucky boy eh! But I have to say the most enjoyable part of the Christmas holiday was on New Years Day. As you know on New Years Eve we had some snow and the next day the ground was pure white. I got a call from my mate Wayne who told me to grab whatever I could get my hands on, a biscuit tin lid, black bag, coal sack, WHATEVER because we were going to mess about in the snow!! Now I know I'm 29 but there was not a snow balls chance in hell I was missing this. Just behind my house the is a very large and most importantly steep hill......BINGO!!! It was the most fun I have had in years. About ten of us were up on the hill and I know there are videos knocking around too, if I find one i'll stick it up here. Anyway it's good to be back and I hope you continue to tune in to myself and Laura in 2010. We appreciate very much you emails, texts, phone calls and of course your listenership in 2009 and we will be up every morning with you in 2010 keeping you company whatever your doing.